Balmoral House Apartment 6017687 73331work01768775926fax Self-cateringBalmoral Apartment, Keswick - Sleeps 2 in a double bedroom. 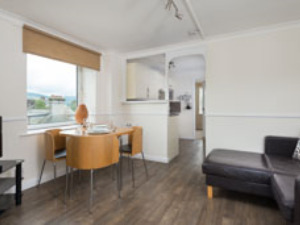 The apartment is situated perfectly to enjoy the vibrant market town of Keswick with its shops, bars and restaurants. Superb Panoramic views can be enjoyed from this 6th floor apartment, looking towards renowned Catbells. Two people can be accommodated in a contemporary double room, Lakeland slate bathroom & open plan lounge/dining area. Balmoral House Apartment 6 sometimes limits bookings to 3 or more days. One double bedroom with double bed. Balmoral House sometimes limits bookings to 3 or more days. Clean and functional apartment right in the centre of town and just next door to derwent water. Couldn't ask for a better location. Small but effective flat. Most of all warm which is wonderful for the time of year we went! The owners were lovely, welcoming, friendly but non intrusive. Them and the apartment are very accommodating. 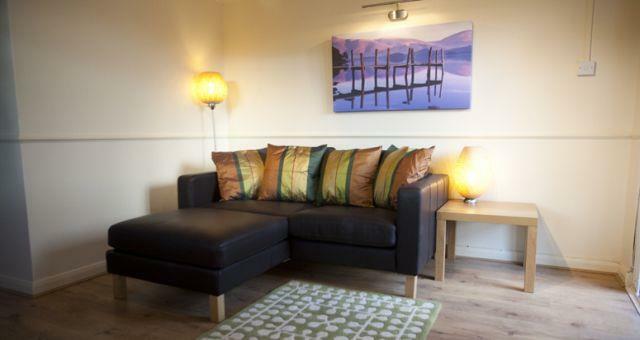 Balmoral Apartment, Keswick - Sleeps 2 in a double bedroom. From the North: Exit the M6 at jct 40 and take the A66 toward Keswick. Upon entering Keswick follow the main road through town, continuing straight through the traffic lights, turning left at the mini-roundabout and parking in Central car park. Sweeney's is located to the right hand side of this car park, where you will be provided with keys and directions to Balmoral, which is just around the corner. From the South: Exit the M6 at jct 36 and take the A590 toward Windermere and the A591. Continue to Keswick located 20 miles to the North of Windermere on the A591. Upon entering Keswick follow the main road through town, continuing straight through the traffic lights, turning left at the mini-roundabout and parking in Central car park. Sweeney's is located to the right hand side of this car park, where you will be provided with keys and directions to Balmoral, which is just around the corner. From the North: Take the train to Carlisle and transfer to the Number 555 bus for Lancaster from outside the station to Keswick. Take the train to Windermere and transfer to the Number 555 bus for Carlisle from outside the station direct to Keswick. From the South: Take the train to Windermere and transfer to the Number 555 bus for Carlisle from outside the station direct to Keswick. From the South: Take the Number 555 bus for Carlisle from outside the train station at Windermere, direct to Keswick.